BUY TICKETS ONLINE TODAY & GET A FREE 1-YEAR MAGAZINE SUBSCRIPTION! SEE THIS BOAT AT THE SAN DIEGO BOAT SHOW! 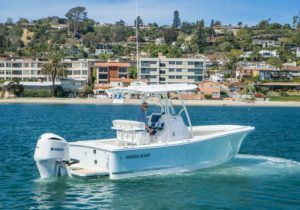 – Kusler Yachts 2018 23 Regulator Marine Center Console IN STOCK – Amazing Regulator Marine 23 Center Console (27’6″ Overall) just arrived in San Diego and ready fro Spring! Offered with a white Yamaha 300 HP outboard, Teak Swim Step, White Powder Coat, Abaco Sky Hull Color, Chrome Boot Stripe, Garmin Electronics Package, Full Transom Live well, Transom Tuna Door, Folding Rear Seat, Massive Fish Box Forward, Forward Wrap Around Seating, White Bottom Paint, Full Stand Up Head in Console and much more. Contact Regulator Center Console dealer Kusler Yachts today for pricing! Tickets will be available for purchase at the show, and e-tickets will be available online.